I put a Sound Blaster 16 in my first computer. It came with a CD-ROM full of goodies like Dr. Sbaitso, the talking psychologist. 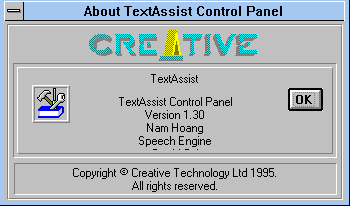 One app was called TextAssist and it had a special syntax that let you string together phonemes, specifying pitch, duration, even vibrato. I spent hours composing weird robot jingles. +yUW _1tAOl=kIHn ~AX [[pbas +3]]+mIY? XCode also ships with a hidden gem called Repeat After Me that helps you build this funky syntax from your own spoken phrase. It extracts pitch contour and fits phonetic onsets of a typed phrase to your spoken phrase. Sorry for asking this so long after the article was written. I tried the " highlighting the following code block, control-click, and go Speech > Start Speaking:" on a Mac and it started dictating numbers instead. Without that, the Mac does indeed start dictating numbers. Not working for me using Chrome nor Text Edit on 10.12.1 with alternate voices; does work with US voices.